Chef Que Vinh Dang brings you through his culinary journey at TBLS. You may recognize his name, as he was the original Executive Chef at Duke's Burger in Soho Hong Kong. Born in Vietnam and raised in New York, Chef Dang has been gracing Hong Kong with his culinary talent the past few years. Recently, I met a true foodie from Spain. When asked where some of his favorite restaurants were, he responded, "follow the chef. Always follow the chef." Great advice. And so I followed Chef Dang to his sparkling new kitchen in Central. TBLS (as in tablespoon) is tucked away in an unassuming building on Hollywood Road. Going up the ancient elevator, I was surprised to step out and see the modern and cozy roof top terrace. 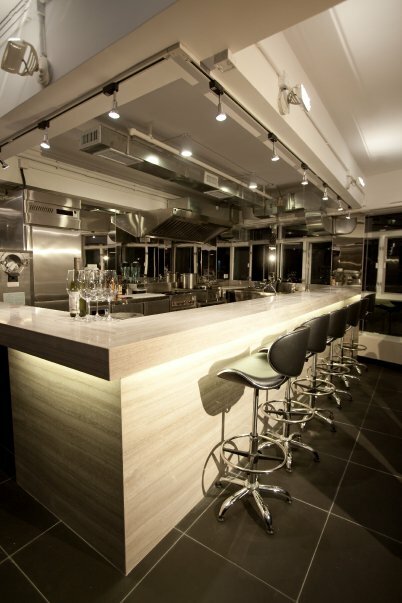 It is a small intimate space with a reservations-only policy so the Chef can personally greet and serve each guest. TBLS is open for dinner only, though they also host private events (a place I'd personally recommend for any private occasion with their isolated rooftop terrace and beautiful open kitchen). The menu is a set 6-course menu, changing seasonally or whenever the Chef sees fit. His menu inspiration? Comfort food. Comfort food is first and foremost about hearty deliciousness. He brings out the full potential of ultimate comfort foods by applying fine dining techniques in original ways. I was pleasantly surprised by items such as the Peanut Butter & Jelly dessert. It turned out to be a macaroon filled with jam and peanut butter ice-cream. Continue on if you would like a glimpse of each course. If you like surprises, I say stop now and just head on over to TBLS for your own experience. The amuse-bouche started the meal with a punch. Rich, flavorful short ribs, balanced by the sharp daikon radish. A soup and sandwich. The chicken rillettes sandwich was delicious. A lot of texture and crunch surrounded by the very buttery moist bun. All chicken nugget serving places should look into his recipe. The mushroom soup was a bit lacking for my tastes. I was hoping for something creamier, more mushroomy, and well... more comforting. Lasagne is definitely one of my personal comfort foods. However, until last night, I had yet to taste a "fine dining" quality lasagne that has matched up to the same satisfaction I get from normal ol' homemade lasagne with layers of ground beef, tomato and bechamel sauce. Que's take is not too far from the original, though he substitutes the normal beef filling with oxtail and iberian chorizo. Delicious and comforting. Slow poached salmon, celery, celeriac puree, in black truffle sauce. The slow poached salmon was beautifully done. The celery root puree made for an excellent pair, but unfortunately it overwhelmed the black truffles. I couldn't taste them. Chef Que did point out later that the black truffles were never meant to be highlighted. Braised short ribs on creamy polenta, with sous vide endives. At first bite, the short ribs were ordinary. But knowing Que, there is a purpose to every last bit on the plate. The sultana raisins and toasted almonds took the short ribs to a new level with the subtle flavors and texture. Green apple and Hoegaarden sorbet for our palette cleanser. This sorbet was one of my favorites at Duke's Burger. I was very happy to have it again last night. I don't know where else to get it! Caught up in conversation with my friend and the allure of the dessert description, I accidentally took a bite before the photo! French toast topped with pear & apricot compote. Salted caramel ice cream sandwiched by two chips. Need I say more? Peanut Butter & Jelly. A clever twist, using macaroons and in-house made peanut butter ice-cream. It was nice to see that the menu was distinctly Chef Dang's with his specific techniques and flavors I recognized. Yet, I was still kept on my toes as there were still small pleasant surprises with certain dishes. Don't come expecting typical fine dining French or New-American dishes. You're here for delicious comfort food, served with a white napkin. Another plus: You can walk out having eaten all things, buttery, gooey, fatty and delicious and not feel all that guilty about it. The 6-course dinner is HKD $480 + 10% service charge. Edit: Also be sure to check out Geoff's Q+A with Chef Que Vinh Dang! Oooh yum a macaron ice cream sandwich! Must recreate soon. yum!!! this looks and sounds fab! my friends were raving about this place recently and it's almost impossible to get a reservation! Will put my name on the list!